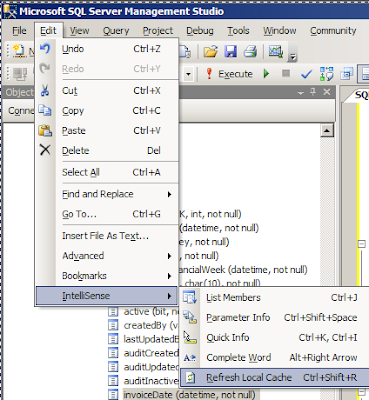 The new feature "intellisense" added in sql server 2008 is making my life easier. And I am enjoying this feature a lot. But I noticed many times that when we make any changes to DB schema like creating / modifying database objects (tables, sprocs, ...) we don't notice the schema changes in intellisense in the same session. This made me too bad and many times I cursed Microsoft for this inclomplete feature. But after making some research on this, I have found the solution to get intellisense for new schema changes in current session. Actually what happens when you connect to sql server 2008 using sql server management studio is, it queries for the current database schema and saves it somewhere. And It uses this schema information for showing the intellisense when the user is writing queries. But when we create/update the sql objects (sprocs, tables, views, ...) these won't be updated and the intellisense is pulled from old schema. That's why we don't notice the schema changes in intellisense unless we explicitly refresh the cache. In order to get new chema changes we must clear the intellisense cache. To clear the intellisense cache we need to click Edit -> Intellisense -> RefreshLocalCache in sql server 2008 management studio as shown in below screen. The Mini Modern Hookah has a beautiful shaft with a small pumpkin shaped. The vase of the this beautiful hookah is made out of glass. The vase is transparent; allowing you to see through. This opportunity makes your special moment more joyful.